As far as I know, no one has as yet proposed banning the books themselves from elementary school curriculums. Still, this could prove to be a slippery slope. At the very least, it casts a shadow on these autobiographical novels that gave me endless pleasure as a child, and that I still admire. When it comes to protecting people’s sensitivities at the expense of free speech, I tend to come down on the side of free speech. Our understanding of history requires an honest discussion of these issues. We must try to comprehend how pioneers who ventured into what was once designated “Indian territory” actually felt about the challenges they faced. It is not terribly useful for us, in our superior enlightenment, to declare how we think they should have felt. True, it would be useful to know more about this era from the Native American point of view, but that is a whole different story. Unquestionably, Laura and her family felt a real threat from Indians. Some encounters were friendly, and some were not. They knew they were taking a risk by moving to Kansas when the Federal government opened it up to non-Indian settlers. The fertile land was too tempting for all kinds of pioneers … farmers, hunters, and cowboys … to pass up. Later, the government reversed that decision, but in the meantime, tensions built dangerously between the old and new inhabitants. Laura described the noisy powwows, punctuated by ear-piercing war cries, that often kept her family up all night as the local tribe debated what to do about the invaders. The most dramatic moment in Little House on the Prairie occurs when a French-speaking Osage chief, Soldat du Chene, arrives on the scene by horseback. He persuades his followers, in the nick of time, not to attack the white settlers. Excessive political correctness in our day and age is as dangerous in its way as Trumpism. Those of us who oppose this vile president, a shameless enabler of racists and neo-Nazis, only play into his hands when we refuse to understand the different context of racial clashes in times past. It is dangerous enough to demand absolute purity of thought in the present; it is futile to demand it from our ancestors. 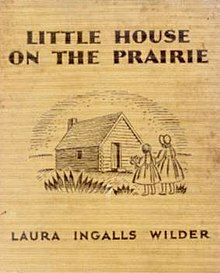 The “Little House” books provide testimonials of how people handled cultural clashes when they were a life and death matter. A long-running television series, also called Little House on the Prairie (1974-1983) provided a more soft-pedaled version, far less jolting to modern sensibilities but far less accurate as well. I would still recommend the books, trusting that most readers would understand that perceptions have changed since the 1870s, and would be able to handle any discomfort that might cause. When I first read these books as a fourth grader, I was capable of understanding that. Why do we think present-day readers, even young ones, must be protected from history?